Double-click a note calendar name in the Calendar List. 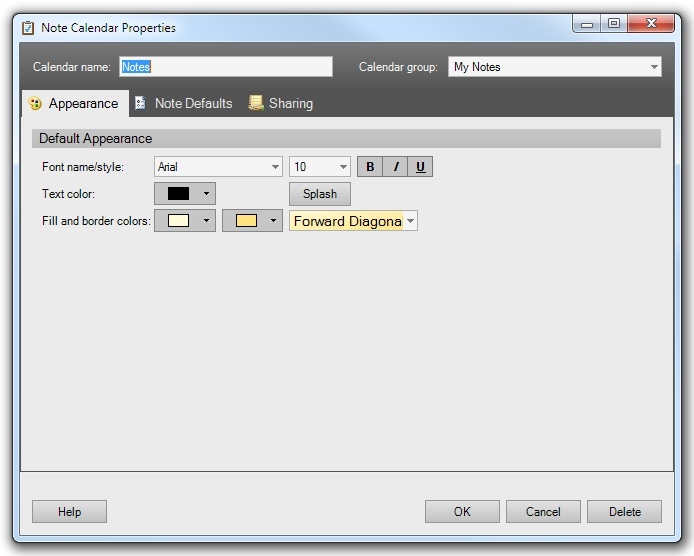 Right-click a note calendar in the Calendar List and select the Note Calendar Properties command. With a note calendar selected, click the Note Calendar Properties command in the Edit menu, or press the F2 keyboard shortcut. The Properties of the currently active note calendar will be shown. Each note calendar of the Calendar List can have its properties individually modified. These properties consist of appearances, defaults, and sharing options (Ultimate version only). Each note calendar can have its own default appearance. This appearance will be applied to any new notes belonging to the calendar. It will also be used by existing notes, if they have not been configured to override the default appearance via the Appearance tab on the Note Editor. The appearance settings can be modified as described here. The following default settings can be defined. These are used when new notes are created. This is the default category to be associated with new notes belonging to this calendar. Categories can be selected by clicking the drop-down button, or new categories defined using the "..." button. One or more categories can be selected. If you don't want a default category, uncheck all the boxes in the drop-down list. When checked, new notes will default to being pinned to the selected date in the calendar view. 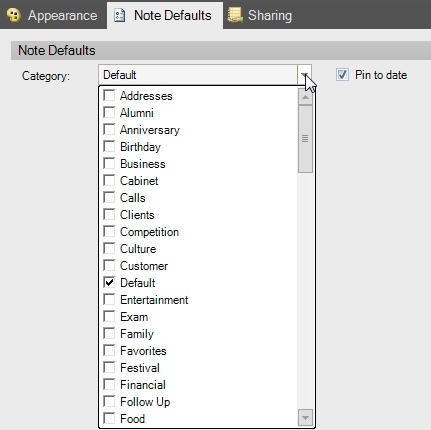 Notes that are not pinned to dates will only be visible in the Note List. When using the Ultimate version, note calendars can be shared over a local network, enabling the same notes to be viewed or modified by multiple people or from multiple computers. Note calendars are shared through VueMinder Server. Installation instructions can be found here. To share a note calendar over the local network, check the "Share this calendar" box. If this is the first time you've shared a calendar, you may be asked to specify the server name. All computers sharing calendar data must be configured to use the same server. The server can be specified in the Sharing Options window. After sharing a note calendar, it can be added to the Calendar List on other computers by using the Add Shared Calendar From Local Network command, accessed from the File menu. When the "Share this calendar" box is initially checked, the calendar will default to being read-only for all people on the network. You can assign a different default permission for the "(Everyone)" identifier, or you can selectively assign user permissions to override the default. In the example above, two additional users were added with "Contributor" permission, meaning they can both view and modify the calendar. All other users can only view it. Permission levels are stored securely in the shared database, using 256-bit encryption. This ensures the data is secure from unauthorized users.